Community Blood Center’s Kathy Pleiman and Fort Loramie Community Service Club blood drive volunteers present a $5,000 home improvement gift card to Sharon Holdheide and her daughter, Emily. FORT LORAMIE – Sharon Holdheide is one of the hundreds of Fort Loramie donors who help make the Community Blood Center blood drives at St. Michael’s Hall the largest in Shelby County. But she’s the only St. Michael’s donor to claim the grand prize in the Build a Better Blood Supply Summer Blood Drive campaign. Everyone who registered to donate blood with CBC from May 29 through Sept. 1 automatically was entered in the drawing to win the $5,000 home improvement gift card. By the end of summer there were almost 19,000 entries. Holdheide entered the drawing when she donated June 19 at the St. Michael’s Hall Country Fun Blood Drive. It was her 69th lifetime blood donation, and it turned out to be very lucky. Her name was randomly chosen by computer as the contest winner. Her husband, Dave, also came from a family of donors, and their children Emily and Alan donate. CBC’s Kathy Pleiman presented the $5,000 Lowe’s gift card to Holdheide and her daughter at the Oct. 16 St. Michael’s Hall blood drive. 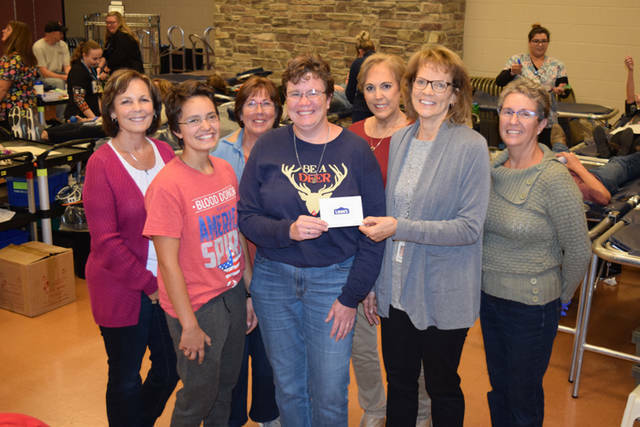 Neighbors and Fort Loramie Community Service Club volunteers celebrated her good fortune. The goal of the Build a Better Blood Supply blood drive was to help CBC maintain a steady blood supply through the challenging summer months. That mission was accomplished with more than 16,000 units donated. Now the grand prize will help the Holdheide family make some home improvements. “It’s very exciting,” Holdheide said. “We walked around Lowe’s one Sunday afternoon for a couple of hours and got a couple of ideas. We’re going to do some new hardwood flooring and get something for Emily who just bought a house. The St. Michael’s fall blood drive reached 100 percent of the collection goal Tuesday with 235 donors, including 230 whole blood donations and 15 platelet and plasma donations. Donors are required to provide a photo ID that includes their full name. Past CBC donors also are asked to bring their CBC donor ID card. Donors must be at least 17 years of age (16 years old with parental consent: form available at www.givingblood.org or at CBC branch and blood drive locations), weigh a minimum of 110 pounds (donors may have to weigh more, depending on their height) and be in good physical health. The Food and Drug Administration changes blood donor eligibility guidelines periodically. Individuals with eligibility questions are invited to email canidonate@cbccts.org or call 1(800)388-GIVE. Donors can make an appointment at www.DonorTime.com. Community Blood Center/Community Tissue Services is an independent, not-for-profit organization. Community Blood Center provides blood products to 25 hospitals and health centers within a 15-county service area in the Miami (Ohio) and Whitewater(Indiana)Valleys.